MYRTLE BEACH, SC--(Marketwired - Mar 21, 2014) - Car racing may not, at first blush, seem to have much in common with spas, but there is more joining the two together than one might think. A car must be meticulously maintained in order to perform well, for example, much as a person must regularly indulge in a little spa pampering to look and feel one's best. Drivers are always on the lookout for the best products to put into their engines, and spa-goers delight in discovering the newest scrubs and oils to put on their bodies during a treatment. In light of these surprising connections, the Myrtle Beach Marriott Resort & Spa at Grande Dunes will be offering the Hibiscus Spa package during the same weekend as Darlington Raceway's Bojangles' Southern 500 Race Weekend. And the two experiences promise to be equally thrilling. As perhaps the most tempting example of Myrtle Beach hotel specials, the Hibiscus Spa package invites guests to enjoy a 20-percent discount on all standard room rates as well as 20-percent off all spa services over $150 at the Hibiscus Spa. The offer is available free of blackout dates during the weekend of April 11 to 13, 2014, which is convenient for guests traveling to attend the 65th-annual NASCAR Sprint Cup Series Bojangles' Southern 500 Race at Darlington Raceway. The race, which has historically occurred in May, has been moved a month earlier this year to, among other factors, capitalize on the cooler temperatures. Whether guests are looking to squeeze in a treatment or two before heading to the race, or want something fun to do while their loved ones spend the day at the track, the Hibiscus Spa package is ideal. 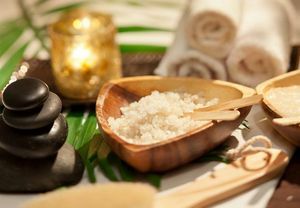 As one of the finest spas on Myrtle Beach, this full-service European spa features treatments like the perennially popular salt scrub and Vichy shower as well as massages, body wraps, facials, manicures/pedicures and waxing. Fitness classes are also available, as is access to the steam room. While staying at one of the most renowned luxury hotels in Myrtle Beach, SC, guests who book the Hibiscus Spa package will enjoy accommodations that are as indulgent as the spa treatments. Marble bathrooms and cotton-rich linens, for example, go a long way toward preserving the sense of peace attained at the spa. As far as Myrtle Beach hotel deals go, this one is not to be missed. Rates start at $104 per night, and guests can secure the package by using the promotional code WNT when booking online or by phone at 1-800-228-9290. Enviably situated along prime oceanfront real estate within a 2,200-acre residential community, the Myrtle Beach Marriott Resort & Spa at Grande Dunes makes a striking first impression. And the follow-up is no less spectacular. Guests can look forward to enjoying championship golf, tennis, a fitness center, a beachfront pool with a waterslide and a European spa during their visit, even if business brings them to the hotel. After all, the 45,000 square feet of flexible meeting space includes access to a full-service business center and cutting-edge A/V equipment, which means meetings are both productive and efficient. Four dining options include the elegant Ocean's on 82nd for steak and seafood, as well as the casual to-go menu of Ocean Blu. The 405 guest rooms, meanwhile, offer a luxurious escape amid plush bedding, high-speed Internet access, two phone lines and premium bath amenities. The Myrtle Beach Marriott Resort & Spa at Grande Dunes will be offering the Hibiscus Spa package during the weekend of the Darlington Raceway's Bojangles' Southern 500 Race.